Enjoy a fun shopping tour at the Lake Elsinore Outlets in Lake Elsinore, California for an ideal shopping experience near the wineries of Temecula and its historic Old Town. 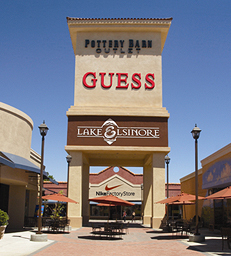 Lake Elsinore Outlets offer a wide variety of outlet stores featuring dining, shoes, glasses and sunglasses, vitamins, clothes, and many others. Big names like Nike Factory Store, Reebok, Levi’s, Bass, Corningware, Guess, and Kitchen Collection can all be found within this shopping center. Food outlets allow the tourists and shoppers to enjoy delicious food in between visiting the shops. There are also many outlets for kids – examples are Toys'R'Us Express and the Children’s Place.